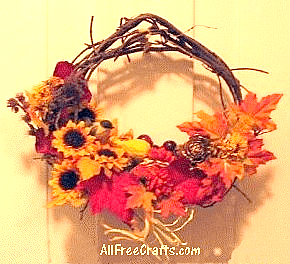 The glorious colors of fall are shown off in this homemade autumn vine wreath, which combines dried florals with a few inexpensive silk flowers and silk leaf picks. The base is a homemade eunonymous wreath, approximately 9″ in diameter – you could also use a purchased grapevine wreath or follow our instructions to make a homemade vine wreath. Your choice of embellishments – I used one miniature plastic gourd, 1 miniature 1″ bird, a bunch of 5 red grapes, one 2″ round pine cone “flower” sprayed gold, and a miniature basket…but the “theme” could be anything that suits your decor. In fact, all elements of this wreath could be substituted with something else, although the overall combination of sizes, textures and “harvest colors” should be maintained for the same look. Tacky glue or a hot glue gun are needed to assemble the wreath – but make a “dry run” first to find the placement that pleases you most. Using a clock face as the imaginary circle of the wreath, you should begin by gluing the three large red maple leafs in place, one at 5 o’clock, one in the center at 6 o’clock, and one beginning at between 7 and 8 and pointing upwards to 9 or just beyond. The cartoon photo of the wreath at right also shows how the colors of the leaves are placed. Place the miniature basket at the 6 o’clock position, behind the center red maple leaf. Fill it with a wadding of paper so that objects placed in it will be viewed at the top, rather than inside. Place the larger yellow and orange leaves in place on the right side, extending up to the 3 o’clock position. Now place the 5 sunflowers, over and around the red leaves, from the 7 to 9 positions. Use the depth of your wreath to advantage here, placing two flowers right at the front, facing outwards; two in the middle, facing upwards, and one at the back, facing frontwards. This accentuates the 3 dimensional quality of the wreath, adding depth and interest. Glue dried rose petals and miniature roses (or other dried flowers) above the sunflowers, from the 9 to 10 positions. Add the pine cone flower to the right of the basket, at the front, and use the orange mums to decorate the front of the basket. Glue the gourd and grapes to the top of the paper in the basket. Find a nice spot for the bird – in this photo, the bird is nestled among the sunflowers. Fill in any gaps with dried miniature roses, dried flowers, small pine cones or other material you may have on hand. Take a few pieces of raffia, or corn husk, about 5″ long, and shred into thin strings. Bend in half, use your fingers to curl the raffia a little, and glue in place at the bottom center of the wreath.